Pursuant to Condition 2.4 of the EP, an environmental monitoring and audit (EM&A) programme, as set out in the Environmental Monitoring and Audit Manual (EM&A Manual) () was required for this Project. Baseline data were collected prior to the start of cable installation works in 2012 and monitoring and audit were conducted throughout the cable installation and after its completion in early 2013 as required in the EM&A Manual. Upon inspection in October 2013 the ASE cable was found to be damaged and a section within Zone A (see Figure 2.1) requires re-installation. 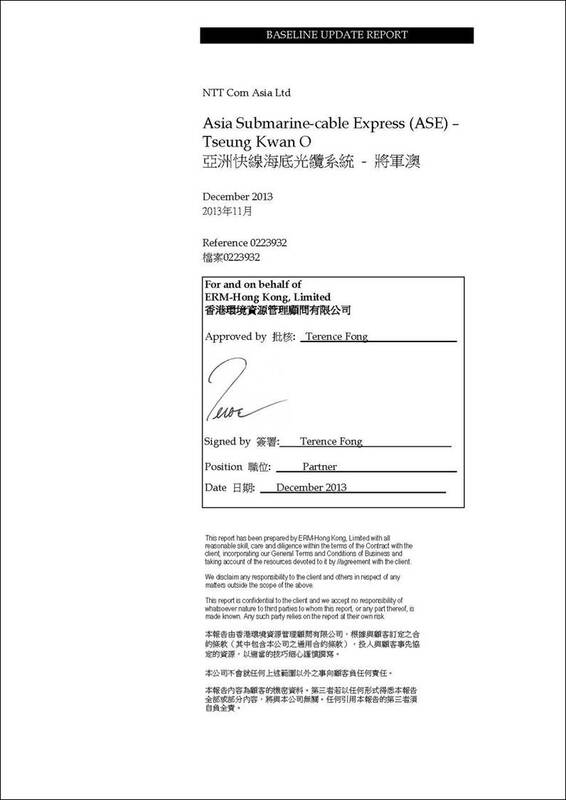 The EM&A programme is therefore required to resume for the cable installation works in Hong Kong Waters (the “Project”). A new coral monitoring baseline survey (Baseline Update) was proposed to be carried out prior to the installation of the faulty section of cable. The Baseline Update survey was attempted in November, 2013. This Baseline Update Report (“the Report”) has been prepared by ERM-Hong Kong, Limited (ERM) on behalf of NTTCA to present the methodology and findings of the Baseline Update Monitoring Survey conducted in November, 2013. Presents the survey methodology, parameters monitored, monitoring locations and depth in accordance with the EM&A Manual. Reviews the condition and health status of corals at the monitoring station surveyed during the Baseline Update Survey and comparison with previous survey information in order to determine if any detectable changes have occurred between monitoring events. This section presents the methodology proposed for the November 2013 Baseline Update Survey, which follows that of the original Baseline and Post-Project Coral Monitoring Survey. During the November 2013 Baseline Update monitoring, however, only Zone A was surveyed due to adverse conditions. However, only one, the shallow region, was surveyed during the Baseline Update. The transect was extended between the 3.5 and 4.0-m contour, as surge became too dangerous for data collection above this depth. Following the laying of the transect line, a coral specialist swam along the transect and conducted the REA survey. The REA methodology encompassed an assessment of the benthic cover (Tier I) and taxon abundance (Tier II) undertaken in a swathe ~ 1-m wide, 0.5 m either side of each transect, due to visibility limitations. Further explanation of the two assessment tiers implemented during the survey is presented below. This section presents findings of the Baseline Coral Monitoring Survey Update conducted in November 2013. The Baseline Update Survey was attempted in Zones A, B and C on November 7, and again November 15, 2013. Weather conditions on November 7 were mainly sunny, with moderate to fresh (Force 4-5) east winds. Moderate swell, surface chop and strong below-surface surge were experienced. Underwater visibility was extremely poor (<0.3 m) along the northeast face of Cape Collinson in Zone A, and a strong north current was present; this area was abandoned and a partial REA transect was run along the south side of Cape Collinson at the 3.5 to 4.0-m depth contour. Visibility was slightly better here (~1 m) at the start of the transect. The line was run approximately along the 4-m contour as the surge became too strong to work any shallower than that depth. The transect was stopped short at 75 m, as the visibility significantly decreased and the surge force increased along the line. The rocks were also covered in sea urchins and barnacles, adding to the hazard in surge and low visibility. The divers considered it too dangerous to extend the transect beyond this point. Conditions continued to deteriorate throughout the dive, and the dive was abandoned after the completion of the 75-m transect. Conditions were assessed at Zones B and C, and found to be worse than those at Zone A; hence the survey was not conducted at those sites. As monitoring was not completed on November 7, the team attempted to survey again at Zone A on November 15. Weather was similar on the 15th, this time with winds (Force 4) from the north to northeast. Surge and chop conditions appeared more favorable; however, similar surge and poor visibility conditions were again experienced underwater and the survey was abandoned without the collection of any data due to concerns for diver safety. Again, the conditions at Zones B and C were assessed as worse than at Zone A, and thus no surveys were conducted at those sites. A detailed description and discussion of the monitoring results from Zone A, collected November 7, are presented below. Seabed composition along the monitored transect within Zone A is presented in Table 3.1. Each taxon in the inventory was ranked in terms of relative abundance in the community and results recorded during the Baseline and Post Project Coral Monitoring Surveys are shown in Table 3.2 and 3.3, respectively. Findings of the REA surveys are discussed below. During the November 7 Baseline Update survey, the degree of exposure within Zone A, along the northeast face of Cape Collinson was (3) – semi-exposed, while the south side was (4) – exposed, thus creating strong surge conditions nearshore. Sediment deposition on the substrate (referring to hard substrates only) was rated as (2) – minor, and seemed influenced by the rough sea conditions and resultant elevated suspended sediment. The seabed along the transect sampled in Zone A was mainly composed of large boulders in the shallow depth region (2-5 m CD), with some patches of sand (Table 3.1). The poor visibility did not allow for observations of seabed between boulders, but previous surveys indicate exposed bedrock is also present here. Some hard and soft coral colonies were present but accounted for less than five percent cover. Moderate cover by crustose coralline algae was also observed. The estimated percentage covers of the major benthic attributes were similar between the Baseline and first Post-Project Coral Monitoring Surveys, which also recorded less than five percent hard and soft coral cover. Both hard coral and octocoral coverage was less than five percent along the REA transect, which is similar to that observed during the Baseline and first Post-Project Monitoring. Compositions of coral assemblages were also noted to be similar to the previous surveys, with six hard coral and three octocoral species recorded. Goniopora stutchburyi and Porites lutea were the dominant hard coral species recorded, while Dendronepthea sp. was the dominant soft coral species found (Table 3.2). The partial REA transect conducted November 7, 2013 was placed approximately in the same location as A-S2 from the previous surveys. Though the number of hard coral species observed was greater in November than in February, 2013, or during the original Baseline monitoring, and soft coral species were fewer, it must also be considered that a smaller area was surveyed during the November 7, 2013 monitoring (a 75-m x 1m belt transect as opposed to a 100-m by 4-m belt transect in the shallow region). Additionally, the placement of transects is not exact, as water clarity and conditions at the sites do not allow for placement of permanent transect or coral colony markers that can be relocated for replication, and transects may not cover the exact space or the same coral colonies each survey. Results of the Tier II Surveys conducted during the original Baseline monitoring and Post-Project Monitoring are provided in Tables 3.3 and 3.4. Coral Colony Monitoring was also undertaken along the REA transect. Coral colonies with similar growth forms and size to those monitored during the original Baseline Coral Survey and Post-Project Coral Monitoring Survey were selected and measured during the November 7, 2013 survey. Data collected for each hard and soft coral colony are summarized in Table 3.5. Photographic records of the assessed coral colonies are provided in Annex A. The average maximum diameter for hard coral colonies assessed during the Baseline Update survey was 15.9±8.3cm, compared with an average of 12.9±11.8cm for the original Baseline Survey and 11.3±6.1cm for the Post-Project Monitoring Survey (Tables 3.6 and 3.7). Average gorgonian height recorded during the November 2013 survey was 45.6±16.9cm compared to 18.9±6.5cm for the Baseline survey and 21.9±7.4cm for the Baseline survey. The majority of hard coral colonies assessed were recorded as having one percent sediment coverage of less than 1 mm thickness. This is comparable to sediment coverage during both the original Baseline and the Post-Project Coral Monitoring Surveys, which ranged between 1 and 5 percent (Tables 3.6 and 3.7). Octocorals were generally free of sediments. Selected coral colonies in the survey area did not exhibit any sign of bleaching, partial mortality or any physical damage during any of the surveys. 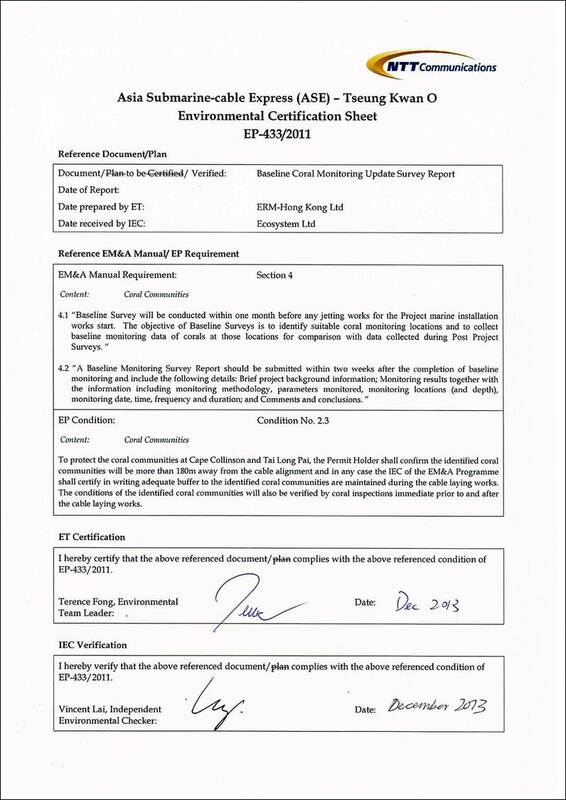 In accordance with the EM&A Manual, a Post-Project Coral Monitoring Survey was undertaken on 18 and 19 February 2013 at three designated monitoring zones (including two Impact Monitoring stations at Cape Collinson and Tai Long Pai, and one Control station at Tung Lung Chau) within one month of completion of the marine works. A Coral Monitoring Baseline Update Survey was attempted in November 2013. An REA survey and coral colony monitoring were conducted in Zone A on November 7, 2013 using the same methodology used during the original Baseline and Post-Project Coral Monitoring Surveys. Due to adverse weather conditions experienced during the November 2013 monitoring, the survey was incomplete, with only a partial REA transect conducted in the shallow region of Zone A (Cape Collinson). Conditions at Zones B and C were deemed to hazardous to allow safe collection of data by divers. However, the limited data collected was comparable to that collected previously, with similar cover and composition of major abiotic and biotic attributes. In addition, results of coral colony monitoring indicated the condition of coral colonies assessed during the November 2013 survey were similar to those assessed during last monitoring survey (February 2013). Sediment cover was low, and selected coral colonies did not exhibit any sign of bleaching, partial mortality or physical damage. The results of the Baseline Update survey do not indicate any significant differences from data collected during the Post-Project Coral Monitoring Survey conducted in February 2013. 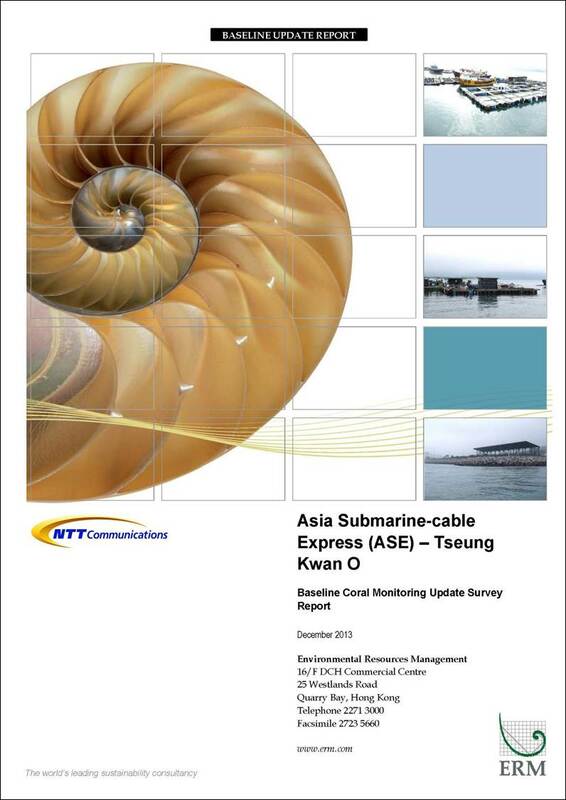 As this Baseline Update survey was incomplete, and the results do not differ substantially from the last monitoring, it is recommended that the Post-Project Coral Monitoring Survey results be used as baseline conditions for the cable repair works. The full dataset for the Post-Project Coral Monitoring Survey conducted in February 2013 are found in Annex B.